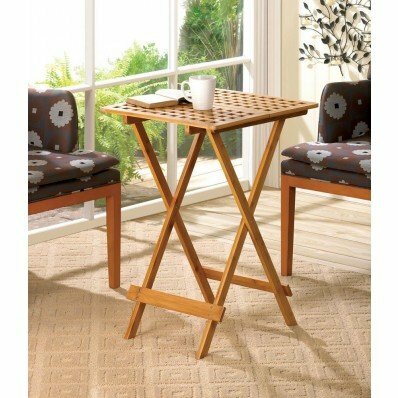 When you need extra table space, this handsome folding tray table will help! The rectangular table top features a geometric cutout pattern. If youre serving appetizers or just having a casual meal in the living room, this handy and helpful tray table will help you in style. It folds flat for easy storage. 19" x 20" x 28" high; folded: 19" x 2" x 32" high. Material(s): WOOD - BAMBOO. Dimensions 19" x 20" x 28" UPC Number: 849179016609. If you have any questions about this product by For The Kitchen, contact us by completing and submitting the form below. If you are looking for a specif part number, please include it with your message.